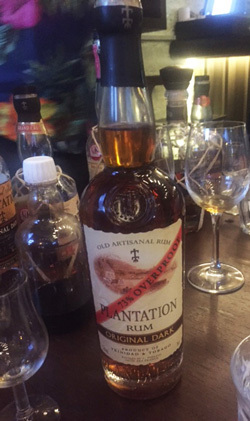 For last week’s rum activity we headed east to Stoke Newington for a Plantation tasting at Caribbean restaurant Rudie’s. It was our first time to Rudie’s, mainly because Stoke Newington’s not particularly easy for us to get to, but we liked it a lot. Think the smell of a smoky oil drum barbeque, the sound of dancehall and reggae beats and a trendy interior. The evening was hosted by Paul McFadyen, co-owner of Trailer Happiness and brand ambassador for Plantation who promised a seven-rum tasting would be crammed into the next hour or so. Certainly a pleasing thought as we’re not overly familiar with the Plantation range. In fact, our experience of the brand extends to a bottle of the entry level Plantation 3 Stars we bought for our new daiquiri obsession. Basically, Plantation owner Alexandre Gabriel selects rums from around the world that he considers represent the country of origin and terroir. They are then shipped to France for a second ageing at a chateau. The rums are sweetened using a cognac method of dosage – a 20% abv rum and sugar syrup that has been aged in barrels for 10-12 years and added in various quantities to each of the rums in the range. We got to taste this syrup and it was a huge hit around the table for its dessert-like vanilla sweetness. First up in the tasting was the aforementioned Plantation 3 Stars, a blend of rums from the three ‘stars’ of Caribbean rum: Jamaica, Barbados and Trinidad. It’s designed to be a cocktail rum, rather than sipping, but sipping does emphasise the creamy, smooth finish inherent in Bajan rums. The rums are filtered through carbon to remove the barrel-ageing colour, but keep in most of the ‘impurities’ that give flavour. 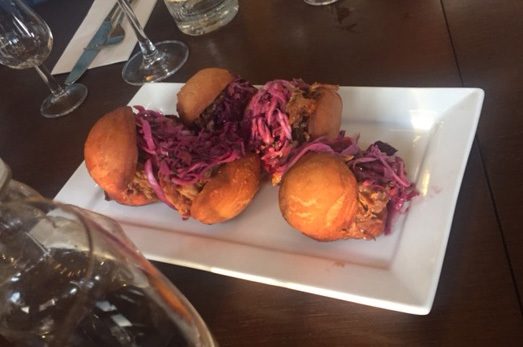 It was at this point that the first plates of food were delivered to the group: fried dumplins stuffed with 12-hour slow-cooked pork and red cabbage slaw. I love fried dumplins so dived straight in! 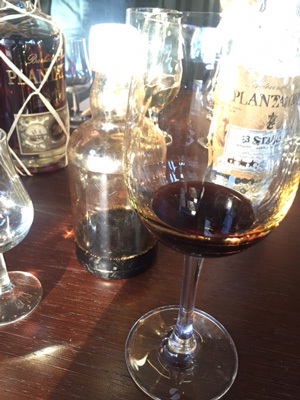 Second rum in our glass was Plantation Original Dark, a blend of three to five-year old Trinidadian rums (read: Angostura distillery), with added caramel. Again, this is designed as a mixing, rather than sipping rum. The third rum was Plantation Signature Blend – five to eight-year old Bourbon barrel-aged Bajan rums, aged for a further year in cognac barrels. Definitely one to add to the collection as it’s so reasonably priced (around £26). Our second food plate then arrived: a huge sharing portion of jerk chicken and cassava wedges, with a selection of Rudie’s sauces, from mild to hot – jerk ketchup, banana pepper (delicious!) and hot papaya. The portions were huge so we ended up having a full meal, rather than canapés as advertised. The fourth rum in the line-up was the Gran Anejo, a Guatemalan rum made from sugar cane honey, popular in central American rum-making. This was billed as Zacapa but with less added sugar and is finished in sherry casks. It’s also much cheaper than Zacapa (less than £30). 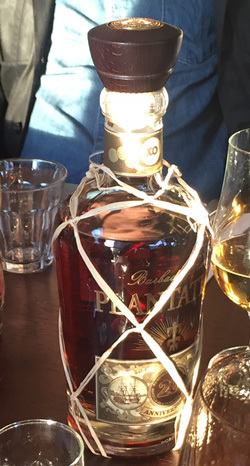 The fifth rum (and nicest looking bottle) was the Plantation 20th Anniversary rum, which is a blend of 10-20 year old Bajan rums that have been aged a further two years in cognac barrels. It was a big hit with some around the table as it was incredibly smooth and sippable. For me, however, although I liked the coconut notes, I found it lacked a robustness in the mouth. The sixth rum was our favourite, and one we are trying to purchase as I write: Plantation 2001, a pot stilled rum from Jamaica. Of course, being a single vintage means there is limited supply and once it’s all bottled, that’s that. As a traditional Jamaican rum, the ester count is high, with a fruity, powerful nose and pungency in the mouth too. It retails for less than £40 too so be quick! The final rum was the overproof (73%) version of the Plantation Original Dark. Once again we were taught how to taste overproof, by opening your mouth to let out the vapours before swallowing. It’s always difficult for me to pick out flavours in overproof, so I’ll just say it was warming! I found the Rudie’s food and vibe a much more authentic proposition than most other Caribbean sit-down restaurants and we certainly discovered a great new rum we want to add to the collection. For me, though, the spicy food sometimes made it difficult to get a proper tasting of the rum, so I’d like to try the 20th Anniversary again with a clean palate as I’m sure the chili in my mouth was not an ideal complement to the smoothness of the rum. I’ll leave it on a did you know: the top five sugar can producers in the world are Brazil, India, China, Thailand and Pakistan – perhaps not what would come to mind first. Next Rum Cocktails – Rum is much more than rum and coke! So much more!